OH, THERE’S MORE. LET’S TALK ABOUT VEILS. As I have written about previously, there is NOTHING that will send a lesbian neo-pagan heretic witch nun into a full-on conniption fit as quickly and surely as a CHAPEL VEIL.Which is reason enough, right there, why EVERY woman should wear a veil whenever she is in the presence of Our Lord in the Blessed Sacrament. If it makes Sister-Comrade Crewcut flip out, then it MUST be a deeply, deeply good thing.But I’ve got more mind-blowing theology to drop. Let’s start with this axiom:We veil that which is HOLY. Okay, so what do we veil? Or, what are we SUPPOSED to veil? At this point, you poor people stuck in the Novus Ordo are just going to have to trust me. And, what else is to be veiled? Why? Because women are the vessels and containers of life in their wombs. And, as we discussed, women reflect the vulnerability and responsiveness of Our Lord upon the altar at the consecration of the Eucharist. The Church has always taught, from day one, that women are to be veiled so that men will be reminded of the HOLY DIGNITY of women, and so that the women themselves will remember and live their lives in accordance with their own dignity. And these stupid lesbian nuns shriek and bellow that veiling is DEGRADING. They are so far gone all you can do is pity them in their utter insanity. Now the tie-in with the priest leaning down and putting his elbows on the altar, reflecting the marital embrace. When a husband is engaging in the marital embrace with his wife in the proper physical position (yes, face-to-face, with the husband above is the proper conjugal position – anything else is disordered at best, and gravely sinful at worst), the husband is VEILING HIS WIFE’S BODY WITH HIS OWN BODY. 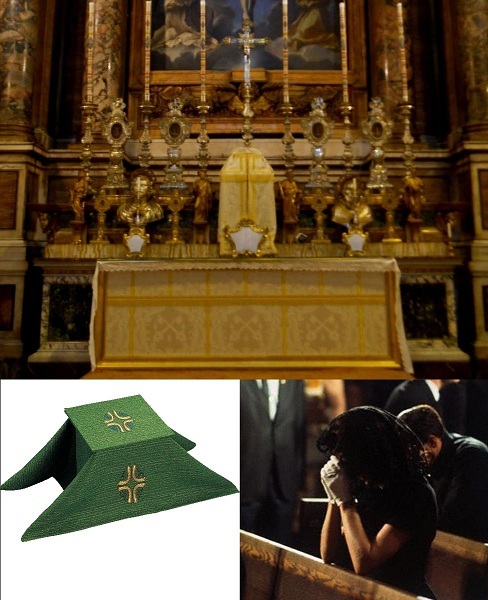 When the priest puts his elbows down on the altar at the consecration, the priest is literally VEILING OUR LORD’S BODY WITH HIS OWN BODY. And remember, the Mass is the GREATER reality, and the marital embrace of husband and wife is the LESSER reality pointing mankind to Our Lord and the Mass. Could this all be any more achingly beautiful? Seriously. Hat Tip on this piece to “Fr. Formaggio”.